I'd to be back sharpish on Saturday night, so I was looking for a new hill, relatively close at hand. 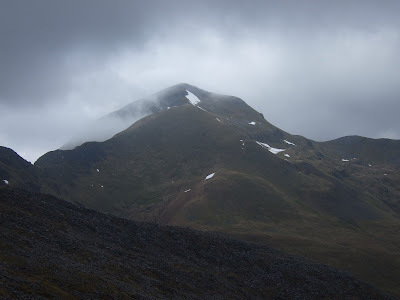 In truth, the two Munros nearest to the house that I haven't done are the ones at either end of the Aonach Eagach, but as that's never going to happen, I settled on Kinlochleven. 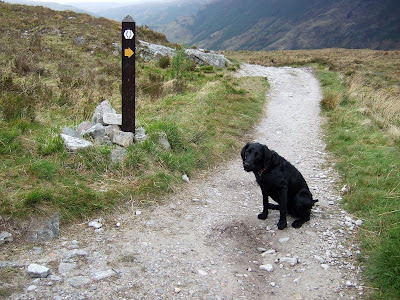 I knew you could pick off Am Bodach from the Mamore Lodge, and thanks to Ken's trip report, I also knew that there were some routes up it best avoided if you were taking a dug. Me & Jorja set off about 8-ish. The journey took an awful long time - it was just one of those days where there was an inordinately large number of drivers who go really really slowly on any sections of road which have bends in them, but then speed up dramatically when you get to a bit that would otherwise have enabled you to overtake. However. The torrential rain which was evident at several points during the drive up was a bit offputting, but it was dry enough when we started walking about 11:15. Out the hotel carpark, then an immediate left turn to follow the landrover track past a couple of log cabiny bunkhouse things, then past a radio mast, then past the West Highland Way track junction. The Wee Black Dug didny seem impressed with the idea of walking to Milngavie. 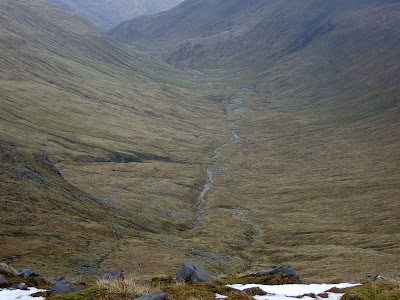 The map also suggests that the path eventually peters out, but although it gets a bit faint here and there, you can't really fail but follow it all the way to the bealach between Sgurr an Iubhair and the start of Am Bodach's western ridge. You would have had nice views into Coire a' Mhail if the weather had been better! The climb up from there actually looked a bit craggier than I had anticipated from the map, but there weren't really any points where Jorja was worryingly close to a sheer drop, so that's always a help. I stuck her on the lead just for the last five minutes or so, but that was mainly because I had noticed several deer in the corrie to the south of the summit on the way up. After last week's shenanigans I wasn't taking any chances. The weather throughout was blustery and drizzly rather than anything else, but I've been out in a lot worse. It took 3 hours to reach the top, and just over two to get back to the car. Part of the reason for the time difference - apart from the obvious uphill/unfitness factors - was that I took a daft tumble about 15 minutes before the bealach. I was on a wee section of steep bouldery path which was badly eroded. It had one of those deep narrow ditch-like bits in it which, of course, you skirt round. As I was doing that I put my foot on a big secure-looking boulder, which promptly gave way. There was nothing underneath my other foot apart from the ditch, and I contrived to collapse over sideways, realising in mid-fall that the gradient of the slope meant that my heid would be going at a fair rate by the time it came to rest. Luckily my momentum was slowed somewhat by a big boulder that caught me perfectly on the left side of my lower back as I landed. My nose grazed the rock that would have got me square on the side of the head if I'd been 6 inches further over. A silly wee slip, on easy ground, but it was too close for comfort, and I did get a bit of a fright. I sat down for ten minutes to compose myself. And to rail at the hill gods about how sore my back was. Mind you, if I'd known how fecking sore it was going to be today, I'd have thought myself lucky. Still, a good route up the hill, a relatively short day and I didn't get completely soaked until the heavens opened for the last 20 minutes on the landrover track back to the car. And I'm still awfy impressed with my new rucksack. I'll maybe need to get another one for the winter! I still twitch at the mention of that bloody hill and that bloody boulderfield! Hope the fall hasn't caused any lasting damage. I remember the "moss that looked like grass" being particularly treacherous on that hill. 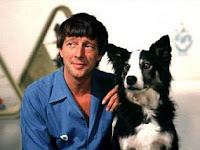 Aye - Am Bodach clearly has the Indian sign over folk with black dogs! 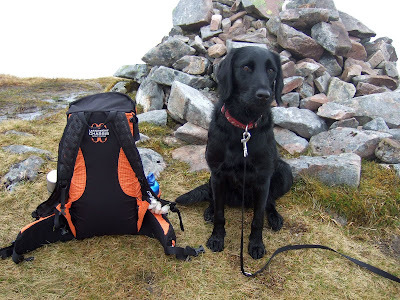 Lol - she'd go for help as soon as she was satisfied that there was absolutely no more food in the rucksack. The very wonderful new rucksack, that is.